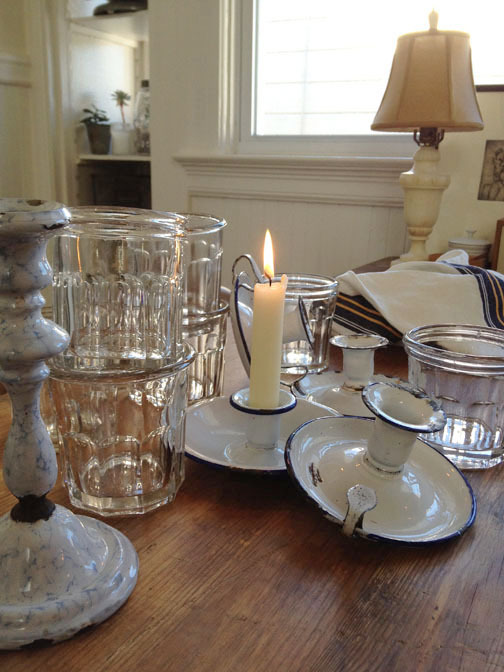 my favorite french antique importer in san francisco welcomed her largest container from france EVER. all i can say is i was overwhelmed when i walked into the warehouse. i have never seen so much STUFF..and most of it was still wrapped up in boxes. she actually lets me dig away..box by box. i found a box full of enamelware and my heart started jumping out of my chest. why you may ask, well...because she has the best prices ever and i can actually walk out with a box full of goodies for under 100.00. they are covered in dirt and grime and in need of a little bit of tlc, warm wather and soap and a splash of hope. here are a few goodies from my recent box of smalls. happiest of thanksgivings, mr. b. street. How lucky can you get?! Love your new treasures!